The walk to Beacon Heights is just another short, easy leg-stretcher we did on our fall trip down the Blue Ridge Parkway. 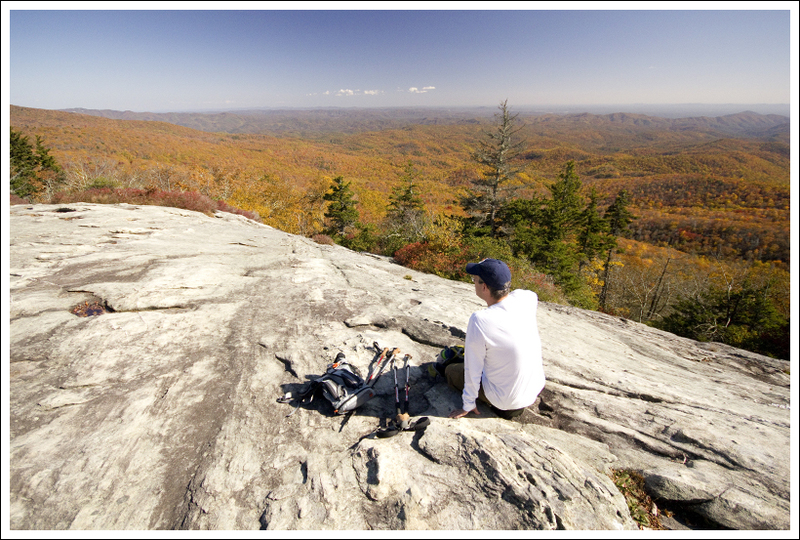 Beacon Heights has the bonus of offering two separate, but equally spectacular, vistas at the summit. Adam takes in spectacular foliage from the view atop Beacon Heights. 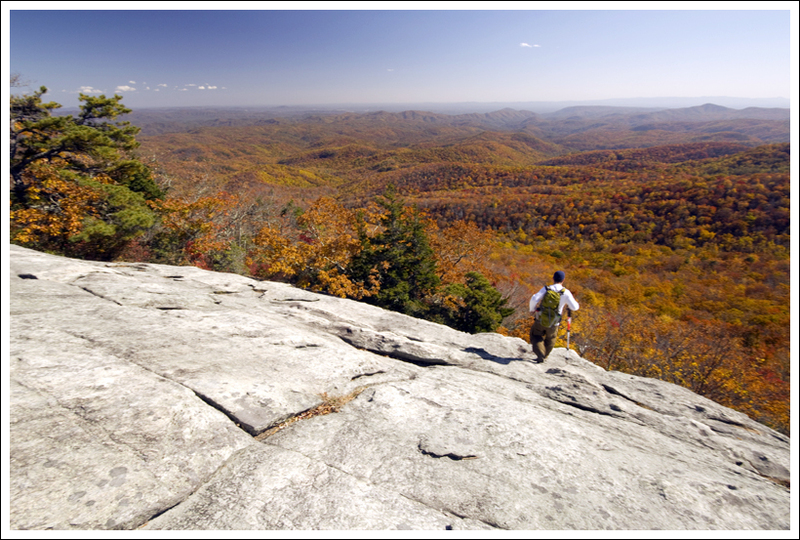 The Beacon Heights trail, like the Rough Ridge trail nearby is a trail that gives you great views for minimal effort. This trail has two different expansive viewpoints at the top. We started off our hike by parking in the parking lot at mile 305.2 on the Blue Ridge Parkway. Across the parkway, you can see Grandfather Mountain looming overhead. Behind the parking lot is another parallel road, SR 1513. We crossed that and found the trailhead easily. The trail goes up and comes to a junction shortly. Take a right at this junction to follow the Mountains-to-Sea/Beacon Heights trail. At .2 miles, you reach another junction as the Mountains-to-Sea trail and the Beacon Heights trail splits. Take a left on the Beacon Heights trail. At .3 miles, you reach a junction where the trail splits where their is a stone bench. Each junction leads to views from Beacon Heights. The path to the left leads to an outcropping that provides great views to the north and west. The path to the right leads to another outcropping with views mostly to the east. Either spot provides plenty of room to spread out and take in the scenery. Head back the way you came for about a .7 mile round trip. Due to the shortness of the hike, you should expect a lot of people at the top. I’ve heard this trail referred to as a “leg stretcher” and that is an accurate description. It is not too difficult, so there isn’t much of a need to get geared up for an intense hiking experience. My favorite of the two viewpoints was at the junction to the left of the bench, since it did provide views of Grandfather Mountain from the top. With a cell tower visible on the other junction, it takes a little away from the view for me. The view on the right side of the bench. This was the last mini-hike of three we did in one day near the Linn Cove Viaduct. It was a great way to finish the day, and a good way to work off some of the English Pub fare we enjoyed for lunch. The walk was short and followed a gentle uphill grade. 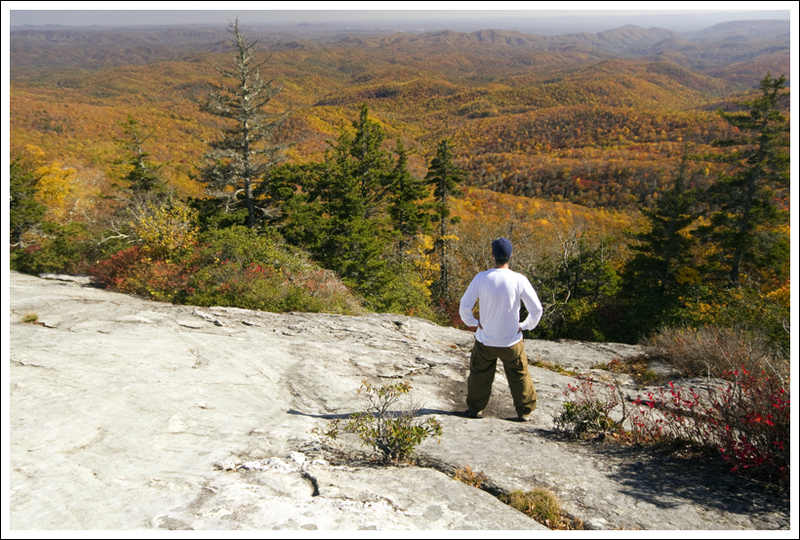 The two views at the top were beautiful, and the fall color was simply spectacular! 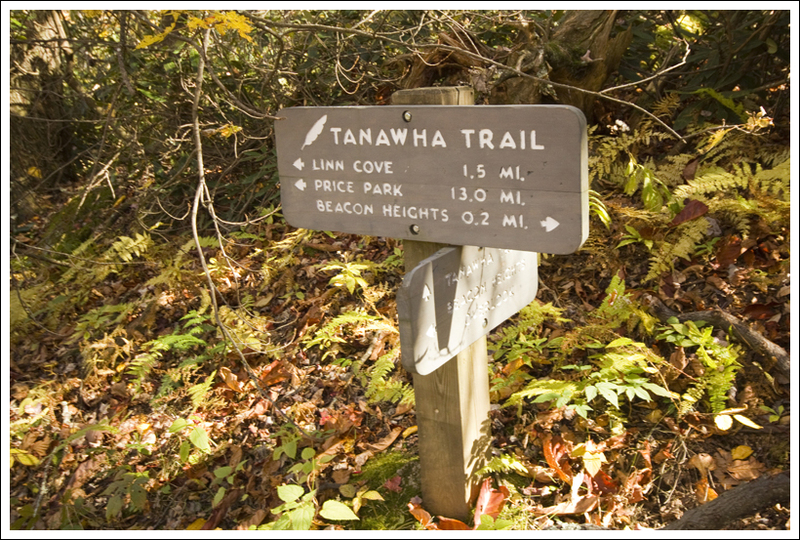 If we had planned our day a little more thoroughly (and if I hadn’t been so sick), I would have liked to park near Beacon Heights and then follow the Tanawha Trail from Beacon Heights all the way over to the Rough Ridge area. It would have been a great out-and-back with lots of scenery and view pay-offs. After Beacon Heights, we briefly discussed tacking on another short hike up to Table Rock, but in the end I was just too worn out to go any further. Adam and I agreed at the end of the day that we must make a return trip to the area to make up for all the stuff we missed seeing on this trip. Difficulty – 1. This is a fairly easy hike. It’s slightly uphill, but almost anyone should be able to make it up. Trail Conditions – 3.5. The trail is in great condition, but rain could leave a few areas slick. Views – 4.5. Just docked it half a point for the cell tower visibility. Waterfalls/streams – 0. There are no streams on this hike. Wildlife – 0. This area is heavily traveled, so it’s unlikely you’ll see wildlife. Ease to Navigate –4. Follow the signs to Beacon Heights and you won’t have a problem. Solitude –1. We saw quite a few people on this hike. 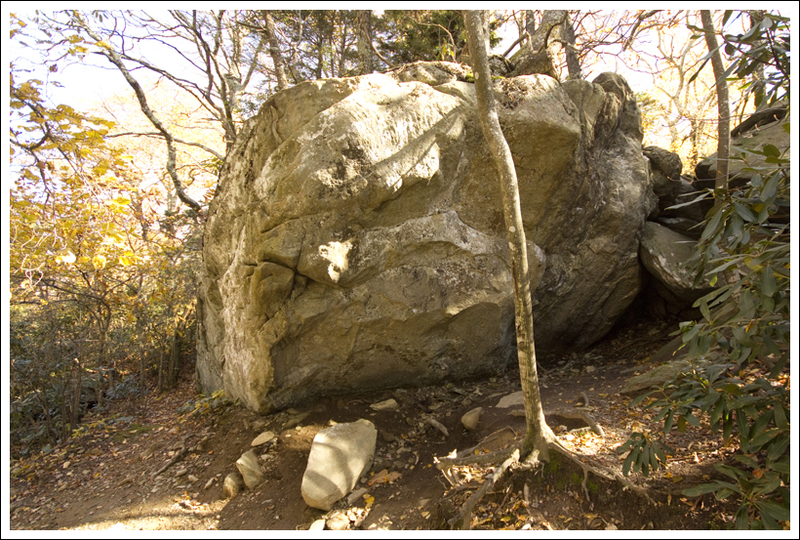 Directions to trailhead: Follow the Blue Ridge Parkway to mile marker 305.2 Park in the parking lot or along the road. Behind the parking lot is another parallel road to cross and you will see the trailhead on the other side.